Thursday evening I logged onto Twitter as I sometimes do, trying to figure out what the world was up to–and boy did I ever. Most of my feed was filled with images and mentions of a dress and sets of colors: blue and black and white and gold. Confused, I knew I quickly needed to jump aboard this dress train before it passed me by. The internet is a quick moving hive of people where things go from a thing to viral to post-viral to think pieces about said thing to exaggerated eye rolls to Buzzfeed listicles about the best reactions to blank in a matter of hours. I scrolled and scrolled noting every mention of the dress–something like 75% of all of my Twitter feed activity. I scrolled three hours back into my feed before I started seeing less and less mentions of the dress, yes, the internet talked about the dress for over three hours straight. And let me tell you, I think this is marvelous. I am on board with #thedress craze–let it be known. If there ever was a moment to truly capture the current generation, how it reacts, and the spirit of the internet age it has to be #thedress. Something minor, a photo of a dress, was spread around so much that it got everybody in the world talking about it! Kim Kardashian tried to break the internet by doing something (quite literally) the opposite of #thedress and it failed at least in comparison to this white and gold (no BLUE AND BLACK!) #thedress. Within hours everybody knew about it, articles were published, and people had faux-arguments over its colors with hashtags galore representing the divide between those who saw it one way or another. Even though it was a divisive issue–the whole thing started by people arguing over its color–in a way it united us in a sort of silliness, a debate that didn’t really matter that in the morning everyone could laugh off. It was like a large comment board where in the end there were no racist comments, death threats, or cyber bullying. It captured all of the potential of the internet, where anonymity doesn’t reveal the depravity of humanity, instead it offered us its best version possible. When I first saw #thedress I had to do research to make sure I wasn’t being trolled. I saw the dress as white and gold and like many others had to figure out if the blue/black-ers were all making it up or what exactly was happening. 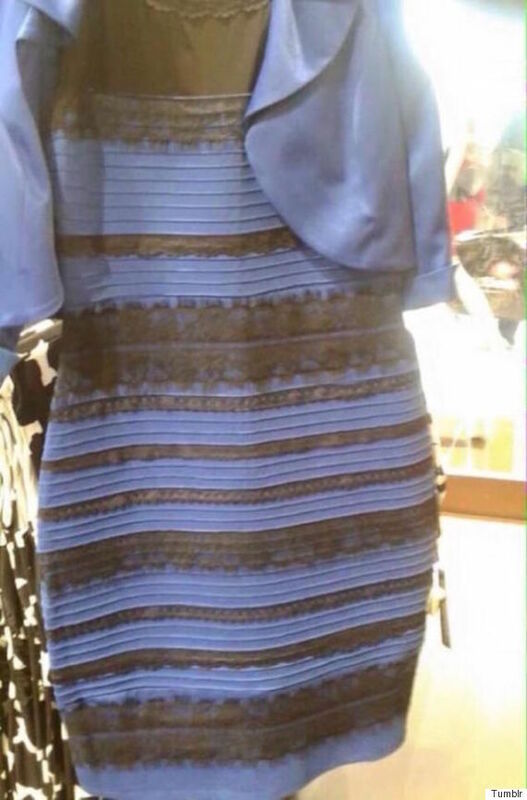 It did seem to be that people were being honest in seeing the dress a different color. I reloaded Twitter and the dress had changed colors to blue and black. I was taken aback, but wondered whether someone had uploaded the picture in blue and black. I scrolled and found other pictures I knew I had seen before, they were also blue and black. I sat there a little stunned. Okay, what do I do with this? This seems to be real and I don’t have an answer as to what is happening. How often does something viral fill you with this feeling? Rebecca Black’s “Friday” lead people to write hateful messages to a 16 year old girl. Charlie Bit Me was comical, but pretty straight forward. “Gangnam Style” was just ridiculous. But this was truly mind-boggling in a kind of wondrous way. I would later discover the real reason–a scientific one based in the ways our eyes perceive color–thanks to a friend who shared the answer with me. I think this is even more thrilling, the internet freaked out about something because of SCIENCE! That’s amazing! I love that the internet freaked out over this, I love that everyone talked about it–jokingly prodding one another over what color it was, and I love that it was completely legitimate. This is the sort of thing that the people of the future who make their own Mad Men about us will cover in an episode, drawing complex meaning from it and portraying us in our strange state of internet. For a few moments this weekend, the internet went crazy over a #thedress and it was wonderful. NOTE: I know that someone is bound to link to people talking to each other in abhorrent ways about this, showing that no the internet did not really get along over this–I accept it, after all this is the internet.